Love it, love it! Especially when I saw the before and after, it made me think 'just maybe I could have a go at that". Beautiful job and beautiful cat! Love this image and your blog is truly helpful..
Congratulations! - this was one of my top vote getters for this challenge - the nice tones fit really well with the image. I also enjoyed reading your blog. congrats for your nice placement, your photo was a favorite of mine. Congrats on the fine placement and score with this - it was one of my top three. I appreciate the notes in your blog, too! My fav of the challenge!! 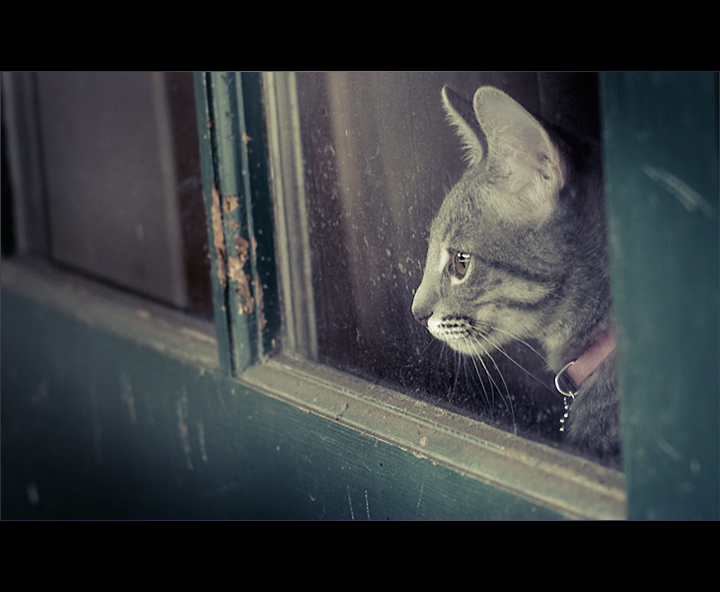 I don't care for cats, but I think this is a really nice photograph. I love the subdued color. Message edited by author 2009-10-19 08:32:55. Congrats on your top10 finish, beautiful shot that tells a lot about how cats are. VitaminB describes this image perfectly. It's a truly beautiful image and I'm so glad it was well received by the voters. Many congratulations on top 10. Like this very much. Enjoyed reading your pp notes and thinking - the result is a fine balance of tones and light. I gave this a 7 too. I liked the colortone. Is it one of those acid-washed processes? That cat really has it's eye on something lol. Congrats on the top 10! I stand by my 7 vote. Terrific image. 'Grats on your Top 10! This is a excellent image. Congrats on the top ten finish. This is just super !!!! and what great photography is all about! Glad to see this in the top 10, nice job, love it. wonderful!! I'm glad this one was yours! Congrats on the top 10!! Lovely soft colours. Great image. 8. For me, the strength of this shot is in the muted tones. The subtle desaturation you chose fits the shot nicely even though it may not be completely DPC friendly. 10 from me. Very nice, love the colors, it looks as if there is an overlay, Great work, 10.
excellent. i love kitties, have a few gems too, but you have nailed this one....great job!! I know it's a cat, and cats probably don't dream, but to me this one is dreaming - there's somewhere she's been to which she'd like to return. Wonderful shot, and the tones are perfect. oh, this is really nice! Love also the muted tones! Beautiful - easily in my top 2 ! Proudly hosted by Sargasso Networks. Current Server Time: 04/23/2019 07:54:21 PM EDT.